On 18th November I'll be chairing Symposium's Successful HR Business Partnering conference for the second year. Last year's event was excellent and this year's looks like it could be just as good. How do you know that you're a business partner? And of course there's my training courses I deliver for Symposium which provide a lot more insight on all of this. So how do you know if you’re a Business Partner? I’m once again looking forward to chairing Symposium’s Successful Business Partnering Conference on 18th November this year. We’ve got a good mix of speakers with some presenting on the role of the HR function partnering with and having impact in a business, and others focusing more on the job of the embedded HR profession – also often called a business partner – as it’s the person in this job who is mainly concerned with making a success of the broader role. I cover both aspects of business partnering in the training sessions I deliver for Symposium Training as well and one of the things I often pick up from these courses is how much confusion still exists over the approach, the role and the job, what they are, and the differences and commonalities between them. To me there are two critical things which make up business partnering as an approach. These are firstly, that HR focuses on the business (or other employing organisation) and secondly, that it focuses on partnering. This makes business partnering, despite some challenges, a perfect name for what we're talking about. The business piece is about focusing on the business/organisation – understanding the business and making a significant supporting and possibly leading contribution to the business. A lot of people would suggest the approach is about a commercial focus too and it certainly does need to include a financial and commercial understanding and clarity about and alignment with HR’s contribution to the business’ financial results. However, I prefer to talk about a business focus as I think we do need to see our organisations in holistic, rounded terms – paying attention to the business operations and financials but without forgetting the people who are behind these things. And despite the need to be more business focussed, most business partners still deliver most value by identifying opportunities to add and create value through the people within a business and the way that these people are managed, developed and enabled. The partnering piece is about aligning the people and the rest of the business – understanding what the business needs and ideally contributing to these objectives based upon what people can do for the business, and then aligning HR activities with these needs so that everything HR does contributes to the success of the business. Partnering is mainly about relationships and it’s therefore relationship management which forms a major focus for my training sessions with Symposium Training. By the way, the major challenge to the term business parter is that partnering is not enough and that something like business player would be a more suitable term. All HR professionals and the whole HR function can and should act as business partners in terms of this approach. i. You’re focusing on a business division rather than a location within a business. This to me is the key distinguishing feature between an HR generalist and a business partner. 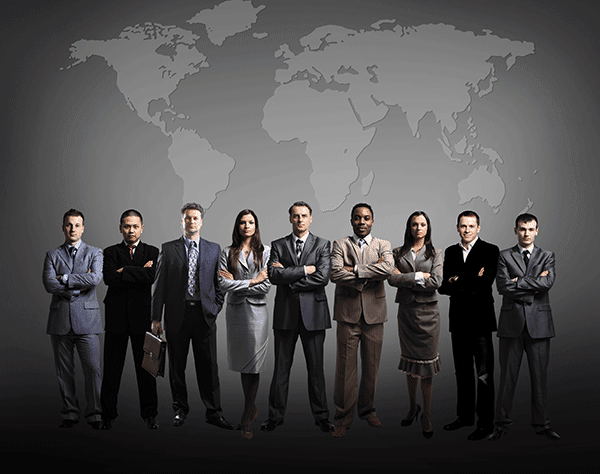 A generalist will typically be focused on all of the divisions of a business at a particular location. This doesn’t stop them from understanding the overall business, or indeed the different business needs of each division, but it does mean it’s harder to understand all of that. It also means that it’s more difficult to act strategically to contribute to the overall business or a particular division because they’ll need to act together with other HR generalists in other locations to do this. The easier and potentially bigger opportunities to focus on are the common needs within the area of the business that they focus on which are the needs of the employees working at their location. So this structural arrangement is going to tend to pull them down, away from focusing on strategic business needs and towards focusing on more people oriented, operational ones. That doesn’t need to happen but it does make it more likely. The difference if you are focused on a division is that you can really, really get to understand your division’s business needs and concentrate on aligning HR activities with these more specific needs. You also probably cover multiple locations so it’s less likely that you’ll get dragged down into operational issues at these different locations. Again this structural arrangement doesn’t guarantee that you will do this but it does make things easier for you to do so. ii. You're also aligned with a divisional director. Another benefit of a divisional focus is that you have one clear business client - the director of this division. You can really focus on them, their agenda, and them as a person, developing the practices they need and developing the type of relationship they also require. iii. It’s not just that you are aligned to a director but that this director is aligned towards you. Partnering takes place in two directions. Even if you’re aligned with only one director if that director is aligned with more than one business partner they’re not going to see either or any of you in the same way. They need to see you as the individual person they will turn to in order to get strategic advice on HR. It also makes it easier to partner if you have centres of excellence and/or a service centre and/or additional legs of the business partnering ‘stool’ (which most often has three legs – business partners, centres of excellence and a service centres – but can have many more) so that you can focus more on the business and your partnering rather than doing or developing HR activities. 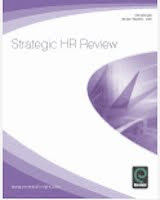 HR then becomes the context for what you do but your professional responsibilities revolve around the business and being a partner (ie: ensuring your relationships with your business clients is effective and that you are aligning everything the other legs of the HR model provide with what your business needs). Note also that one of the most interesting changes in partnering at the moment is the development of the business partnering context to include other areas that are not traditionally part of HR (eg: IT and facilities management – so that you’re not just partnering into HR but into other functions as well). Where you do have responsibilities for HR activities, and most HR business partners do, it also helps if these are strategic, business related activities such as organisation design and/or development, rather than HR oriented and operational ones (eg: dealing with employee relations cases). If you’re supported by all three of these things, I’d suggest it’s pretty definite that you’re acting in a business partnering job. If you’re not doing any of them it doesn’t mean that you’re not a business partner but you’ve got things stacked against you so it’s going to be less likely that you’ll be successful. Which ever of these apply – whether you’re operating in a business partner’s job or just trying to act in the broader role, and if you’re in the job how ever many of the enablers I’ve listed apply to you, I am sure you will find topics of interest and of value, being discussed in Symposium’s Successful Business Partnering Conference, so I hope that I’ll see you there. The above post has been updated from an original version posted on Symposium.co.uk. 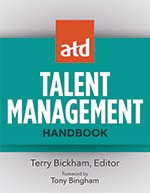 I thought it was interesting that the 'people are our most important asset' came up at both of the conferences I was trying to follow virtually, in between other things, yesterday - at HR Tech Europe and Symposium's Talent Management and Leadership Development summit. The question at Symposium was how do make this real in our organisations (ie how do we act in a way which demonstrates people are the most important asset). And the point at HR Tech was that although people might be the most valuable asset, this doesn't necessarily make HR the most important department. Actually I think both points need the same response - HR needs to understand how to leverage this most important asset in order to create competitive advantage. One we've got this understanding, 'it' becomes real, and HR does become the most important department. 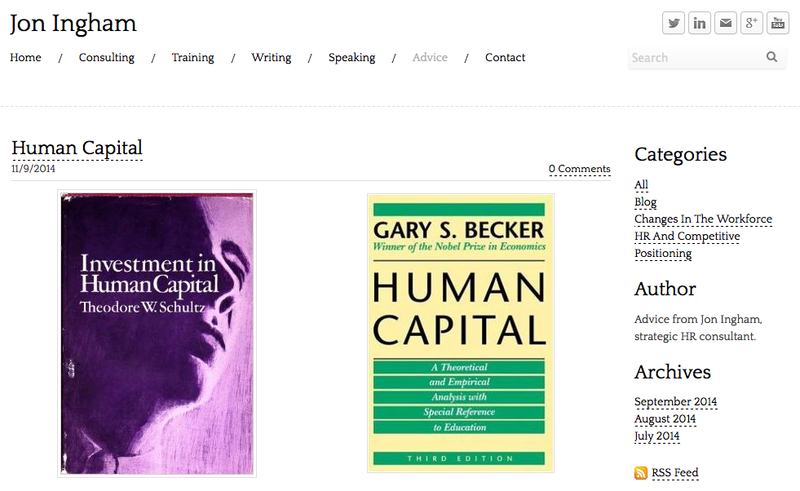 I completely agree that human capital sounds a dreadful term when we actually mean people. But human capital is the main outcome of what we do. We can't avoid the term and be strategic. There you go. But if you've not got time to look at all these posts, just review the accountability one as I think that's probably the most important, at least in explaining why HR is the most important function. And actually even if you don't believe this logic, I still think it's useful to believe HR is the most important department. I like the NLP concept of self limiting beliefs and I think our tendency to see HR as a distinctly unimportant function is definitely self limiting. I often encourage HR to have more confidence, even a bit of a swagger, as we undertake our role. I don't think a swagger would actually be helpful, but sometimes we do need to over-compensate and I think it'd still be better than rather apologetic way we tend to carry ourselves today. I'm not at HR Tech Europe this year - after chairing the event the last three years and seeing attendees increase from, I think, about 300 to 600 to 1200 to hopefully over 2000 this year it's time to focus on other things for a while. 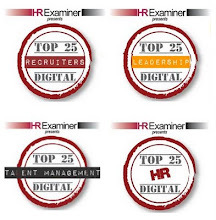 However I am still very interested in HR technology and look forward to following the tweets. If I was chairing I'd be commenting about how HR's perfect storm of social, mobile, cloud and analytics has been progressing with more new technologies starting to take hold the role of the four most important starting to shift, with social becoming more about culture (about time too); and mobile developing into a much greater focus on apps; cloud becoming a less important issue (actually I never considered it on the same level as the others being mainly a delivery vehicle rather than changing the nature of what is being delivered). The one of the four which seemed to have grown in emphasis, becoming a bit of a prima donna at the HR Technology (US) conference, is analytics and it'll be interesting to see whether we have the same take on its growing importance over here. Despite my articles during HR Technology I personally think analytics will be a big part of the future world of HR (I just don't think it can ever be the major part of that - so a part of the future rather than being THE future.) I also think analytics is at an interesting junction, where its use could develop into something really useful, or remain in the background. And to me, this depends on the use we put it towards. I mentioned in my perfect storm article that an additional tidal surge was developing out of an increasing focus on usability. This is about making HR technology something which benefits members of our workforce, not just HR or line managers (see my post from the first HR Tech Europe for more on this.) That same agenda is now coming to analytics too. In fact we saw some of this at the US conference where several of the tweets and posts addressed the potential for analytics to further reduce the H (human focus or humanity) in HR. Analytics will always be something we can use to help manage our workforce but the most interesting data on the workforce is now being generated by our employees themselves - from their tweets, their survey responses, their wearable devices etc. And we can use some of this data too but the more of it we use, particularly if we do that in the normal rather crass way we tend to do these things, our people are going to rebel. The more we use their data, the less we're going to get. The only way to resolve this paradox is to think about using this data and our analytical capabilities differently. We need to focus on giving our interpretation of our employees' data back to our employees so that they can use it to improve their performance. Take Sociometrics' analysis at Bank of America as a good example - I"m not sure how they went about this but most employers' attempt to give their employees RFID or other devices is going to be met with some friction, and that's likely to be an understatement. But as wearables become more popular, led most probably by the Apple Watch, people are going become more used to the idea of the Quantified Self and they're going to understand the rationale for the Quantified Organisation. But they're only going to comfortable being quantified if they're the ones who get to use the quantification. The MagicBands allow visitors to choose whether they share their personal data. For example, they can connect their card payment details, so they don’t have to carry a wallet around the park. Parents can also share details such as their child’s name and birthday to make the experience more “magical”. 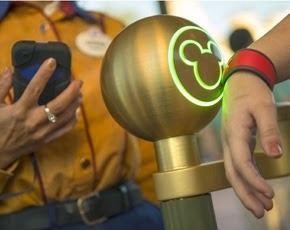 If a child tapped their MagicBand on a reader when queuing to meet a Disney character, the character would then have information on that child, which could be used to personalise the experience. The article makes it clear that Disney is getting benefits from the devices themselves but the system only works because guests are getting the biggest return. If we remember this then I do think analytics could be the biggest of the four forces on HR. Of course it still won't be the future of HR and I still have other concerns which I'll come back and address over the next few days. Britain Needs a Pay Rise - or at least fair Pay Differentials! Saturday saw the TUC's 'Britain Needs a Pay Rise' march in London and other UK cities. I think we saw the effect of pressure on reward after years of low or no or negative pay rises (the Bank of England suggests that average weekly wages adjusted for inflation have fallen 5% since 2010). 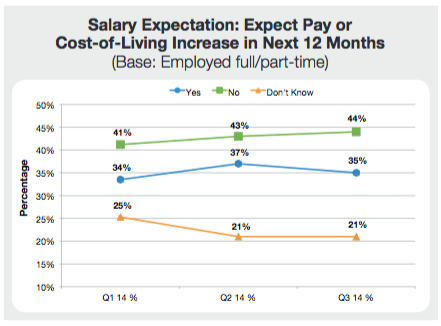 Low expectations of pay increases was of course one of the issues identified in my discussion on Glassdoor's Q3 2014 Employee Confidence survey which I reviewed last week and is shown in the graph above. You can see my thoughts on our requirements for a pay raise on my Linkedin blog. It's great to see UK unemployment falling below two million (for the first time since 2008) in the latest Office for National Statistics (ONS) figures. It's also great to see employees’ expectations about the future improving quite dramatically in Glassdoor’s Q3 2014 UK Employment Confidence Survey. 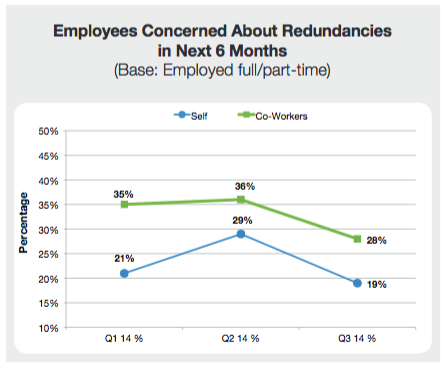 The 10% fall in fear of redundancy is a big change from last quarter and would seem to be due, at least in part, to a reduced level of organisational belt tightening with employees reporting less restructuring, redundancies and hiring freezes. Whilst it is disappointing that we have not yet seen advances in all of the indicators provided by the survey, the large jump in job security should mean that there are a lot of happier people about, and that businesses are set for improved financial performance. We can therefore hope that job security is a lead indicator of further recovery in the job market and that we will see further gains in business outlook and job market optimism as well as increased salary expectations during the next quarter. This is a critical change point for employers. Whilst employees have been afraid of losing their jobs, or even just been worried about their colleagues’ prospects (as we saw in Glassdoor’s survey for Q1 2013) it will have been much harder for them to really focus on their employers’ and customers’ requirements, rather than on what they themselves have needed from their jobs and careers. With increasing confidence there is now a much greater opportunity to connect employees with the aims and aspirations of their employers. 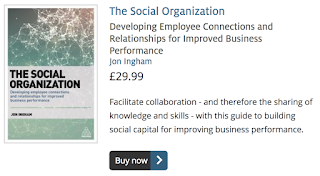 Organisations therefore need to find and create more opportunities to help their people engage, for example by involving them in business planning or work-based communities, or just by increasing opportunities to socialise with one another. Employers should therefore expect and prepare for rapidly increasing pressure on reward - particularly in those sectors and organisations where there has been little in the way of increases over the last seven years. The public sector is an obvious example and continuing austerity is likely to make this an increasingly challenging environment over the next few quarters and beyond. Preparing for this new environment may require better identification of who is really important in an organisation, and in particular who will drive new growth opportunities, or maybe better and more agile succession planning. However it is still early days and the economic recovery is still fragile so the gains in confidence seen during this quarter could still easily be reversed. Companies will therefore benefit from continuing to communicate openly with their staff, helping employees commit time to new opportunities but also to be aware of risks and their potential consequences. Doing this could help businesses address any challenges they experience but should also avoid major surprises for employees if business confidence does reduce again, or if it simply continues to bump along, showing small shifts up and down, for a few more quarters to come. By the way, I'm acting as Glassdoor UK's HR expert, helping to promote the findings of this research so look out for more comments from me in the press! This was my report from Q2. In fact I've been following the tweets from the NeuroLeadership Summit (NLS) in San Francisco as well as HR Technology conference (HRTech) in Las Vegas. Not an easy thing to do! - NLS has been replaying the points raised last year about the importance of attention and the negative impacts of tweeting plus the need to pause every 15 minutes to give the brain to take hold of new learnings - well following, tweeting and blogging on two conferences after a hard day's work in the UK has certainly had my hippocampus working hard. It's been particularly difficult because I've been struggling with both agendas. I don't agree with the prevailing mindset on analytics at HRTech which has made it difficult to learn. And I'm no expert on neuroscience (yet) so I feel NLS has given me a lot to take on. In fact I was listening to one of my most fascinating sessions I've ever attended to at any conference quite late last night and which focused on the neuroscience of values but I still fell asleep half way. No problems though - we know how important sleep is to health, learning and performance. One of the reasons I found the session on values so interesting was because it focused on the extension of ideas within the brain to the level of the organisation. Eg we can understand what we value by looking within the brain but doing this can also help the way groups of people in an organisation change what they value too. I saw this link between quite a few of the things we discussed at both of the conferences. For example today at NLS we've been focusing on Carol Dweck's ideas about fixed and growth mindsets. I've got no data for this but intuitively I link this to what I've been seeing as a split in the HR agenda at HRTech between a focus on business and one on people. The people / growth agenda certainly came up a couple of time at HR Tech with questions about whether analytics reduce HR's humanity and whether there's enough Human in Human Resources. But most of the agenda was about how we fit in more closely with existing ways of doing things within a business. Don't have a seat at the table? Ask if there's something you're not doing right. HR priorities MUST be business priorities. To become CHRO, must know your HR stuff AND your business. You are a business person, not a support person. I linked all of this to the fixed mindset because it treats people as essentially static resources which can be moved around to meet business needs - sometimes almost literally ie John Boudreau talked about analytics making talent more like a game of chess. 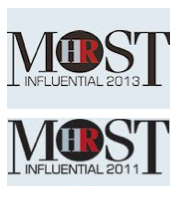 If you trawl through the HR hierarchy you quickly find that it is dominated in number by women. As an objective fact, women are massively under represented in positions of power. In technology businesses, there are a pitifully low number of female CEOs and women are leaving the business in mumbers. Fortune reports there are only 24 women CEO’s among the Fortune 500. Given that skewing of the data, is it any surprise HR is often the poor relation in the C-suite? There were other overlaps as well. These relate in particular to values and culture which I started to refer to earlier, and also performance management. But I'm going to come back and address these two topics separately next week. Both are normally great conferences - helped by the space they operate within as there is so much new and highly impactful within HR tech. However as I'm not chairing HR Tech Europe this year (three years was quite enough for a while) I have a bit more freedom to say that I think one aspect of these conferences needs firmly squashing down into place. Yes - it's the Analytics, Analytics, Analytics focus which kicks off HR Technology (US) this year. I do understand the link. Technology often generates a lot more and more useful data and insight than we've had access to before. We should use that potential. But that doesn't mean it's the future of HR. Even HR technology isn't THE future, though increasingly it's a large part of it. But analytics isn't even close to playing the role that HR tech can play. Basically, it is important, it's even something we should focus on more than most HR functions do, and I try to play a role in moving it forward eg I'm currently planning a two day session with an HR Analytics team for early next week. But other than filling a conference room, all of this hype around the topic does us (HR, and HR Analytics professionals) no good what so ever. HR analytics is a big thing - a big part of the future - for HR tech vendors. Cornerstone's acquisition of Evolv is a good deal for them (even at $42.5m) but that doesn't mean it's a big thing for HR. In fact the way these things go often means losing a lot of the functionality (at least for companies using a competitor HR system) which made the acquired technology so exciting anyway. Forget what they say - it's great, but it doesn't apply to the rest of us. We don't have Watson. And Google, with Project Oxygen etc (sold by Rahat Harfoush as her best example of an Engineered Ecosystem) isn't completely reinventing HR, it's reinventing HR at Google, that's all. Even there we'll have to see whether trying to treat people in the way they treat engineering problems is a good idea or not. But in my view caling their HR department People Operations doesn't inspire confidence that they have a clear, strategic approach to HCM. Businesses and HR are going through huge changes. Recruitment, learning, performance management, pretty much everything we do are going through huge transformation - what we did in HR years 10 or even 5 years ago has little relation to what we're going to be doing in 10 or even 5 years time. So understanding what we've been doing over the last few years often has very little relevance for the next three. The need is often for big scenarios mapping out the range of possibilities at high level rather than big data plotting out the detail of one potential future which is unlikely to take place. And yes I know that analytics can help with scenario planning but if that's what we're suggesting then it's scenario planning which is the future, not the analytics! 4. There's little data about what's important - so don't build your strategy around your data! Assuming there's no major changes going on (when was the last time that happened?) it's still difficult to generate really useful insight from data. The more important something is within HR generally the harder it is to measure, and the more likely it will be that you'll need to use qualitative and subjective measures. The more you can use quantitative and objective metrics, generally the lower the level of value. It's why it's so dangerous when people suggest things like 'I believe we should be able to calculate the ROI on everything we do and if we can't calculate it, we shouldn't do it'. And why McKinsey have it backwards when they suggest that if the CEO and head of HR haven’t recently discussed ideas for using data to generate a talent strategy that’s more closely linked to business results, it’s time to start. This isn't the right place to do this. Analytics is often associated with the quants. It needs to be redefined to be much broader than this. Often it's the qualitative information which can offer the most intelligence, and is in any case the only the thing can be measured. The panel at HR Technology (US) have been suggesting that analytics support storytelling, but if stories are what are important then just collect stories. HR also operates in an environment of greater complexity than most of the rest of the business - and understanding complexity needs synthesis not analysis. So we need wisdom artists not data scientists (see the work we've been doing in the UK and Croatia on the Art of HR. 6. Most current case studies are rubbish, and that tells us something! I think it's because of these concerns that most (make that nearly all) case studies I read on analytics leave me completely underwhelmed. I am pursuaded by big data - I think the potential insight which can arise from examining unsuspected correlations, and not worrying about causation, is real and significant. But again we tend to only have this data about very operational things so although the financial value of big data analytics can be quite high its strategic value is always going to be very low. The case studies on the more normal predictive analytics are usually embarassing. Qantas conducting regression analysis to understand it wasn't a great idea to get rid of its best people is one example that sticks in my mind for its inanity. We often need better strategic thinking, not better analytics, though both together is obviously best. Sometimes it's suggested that it's worth putting up with all this malarkey ie doing analysis to get insight you already know just so that you have the data. That's complete rubbish or at least very expensive. And at some point you're still going to have to have a conversation with your stakeholders to explain that not everything needs to be measured to be manageable and that sometimes it's not worthwhile. A linked argument for analytics is often that this is the way business works and therefore that's how we need to present our conclusions. Well, yes, that's true but if that's all we do we've missed the plot. We need to fit into the existing paradigm to establish credibility but then once we've done that, help change the paradigm. Where we can measure and analyse we should do so, but we also need to develop comfort in managing without measurement. Although other business leaders are interested in getting more insight on HR and do seem to love criticising our lack of analytical capability (forgetting that they've stopped us investing in the HR technologies we need to do analytics effectively), HR often isn't their main priority (yes of course it should be) and concerns about boiling the ocean will often restrict the level of analytical investment which will go into HR. We'll have to wait our turn. This point is a bit pedantic but I still think it's important to recognise that where analytics does provide insight it's often not for us. The panel at HR Technology (US) talked about the Board and pension planners but to me the key need is to provide information to employees. Take wearables - you can use Evolv's solutions to understand your call centre agents movements and shift patterns and manage them better. But in most organisations that's going to result in a break down of trust and lots of dysfunctionality. Much better to make this information available to employees and help them use it to improve their own wellness and performance etc. So if analytics is the future, it's the future of workforce liberation, not of HR! Of course there are ways to generate value from analytics fairly quickly but that involves throwing out all the maturity curves (which are hopelessly self limiting) and focusing hard on your people management strategy, then working out which metrics and what analytics can provide insight on the execution of this strategy for you. But that's about strategy not about technology so I don't see much arguing for it going on at HR technology conferences, however great they are.